Babies are cute. They’re also necessary for humanity’s survival. But for mothers, their arrival dovetails with a significant economic event: the moment when their earning power starts to lag that of male peers. Season 2 of The Pay Check features an in-depth look at how motherhood explains so much of the $28 trillion global gender-pay gap. Benjamin Netanyahu is potentially facing multiple counts of bribery and fraud, but he will still likely win a fifth term as Israel's prime minster. Wall Street CEOs were grilled by Congress on everything from income inequality to their ties to politically controversial industries. Google became the world’s most profitable internet company on the back of search advertising. Now it's doing the same thing with maps. Bloomberg Businessweek reports on two families, a lawyer and the quest for an inheritance that may not exist: The tale of the long lost gold. Even with an economic slowdown and significant risks, the Fed’s outlook remains broadly positive, minutes from last month show. What’s Joe Weisenthal thinking about? The Bloomberg news director thinks those folks worried about Europe’s “Japanification” may want to rethink their premise. The link between inflation and economic health is tenuous: Japanese unemployment has been falling for almost 10 years and inflation has gone nowhere. Europe’s unemployment rate is much higher than Japan’s, and politically, Europe can be charitably labeled unstable. Japan has issues, too, but for Europe, maybe Japanification should be seen as a goal. This is how Chinese citizens are watched and rated. A lawsuit forced Hormel to reveal what “natural meat” means. There are no Swedish meatballs at Ikea's first Manhattan store. The latest trend in furniture is chairs that are over five feet wide. Some GOP senators pulled their support for Herman Cain. Booze dynasties control $70 billion of the world's liquor wealth. Uber will seek about $10 billion for its IPO. 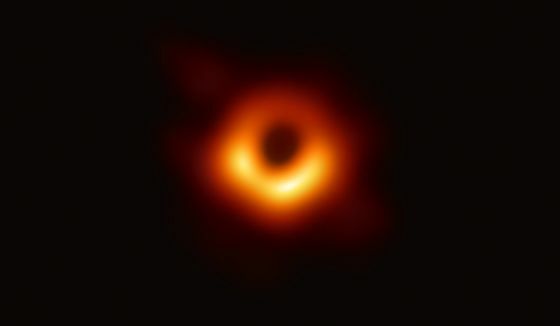 Astronomers revealed the first-ever glimpse of a super-massive black hole Wednesday, as the Event Horizon Telescope revealed a "ground-breaking" discovery that opens up questions about conventional physics.